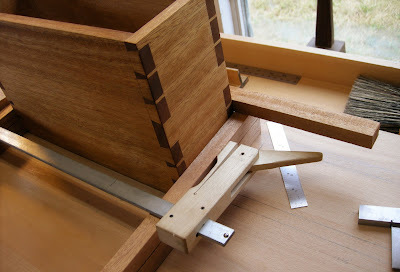 With the dovetails dry fit I’ll take some of my scrap wood and try to get a sense of the weight and dimension the stand should be for the piece. 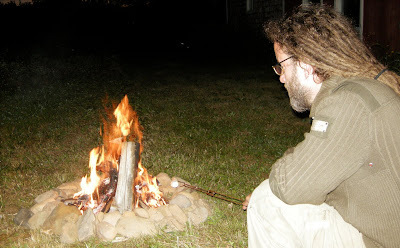 I want things to be slight and skinny, with a modern sensibility about it. The exposed joinery on the box will also be reflected through the stand joinery but first I’ll have to dimension some stock. I’ll continue on with some cross cutting and ripping followed by some more surfacing, shooting and then smoothing until I have all of the components needed to make up the stand. The process is repeated again at my make shift saw bench. Above you can see the nice deep scribe line I’ll be able to cleanly plane to; the round blade and body of this style marking gauge makes it easy and accurate to ‘roll around the edges of the work piece. With the legs silky smooth I’ll go ahead and glue together the box. 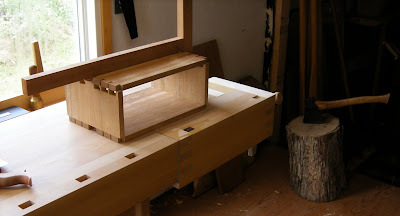 Once dry I can finish plane it and then start fitting the legs to snugly wrap around the dovetailed carcass. 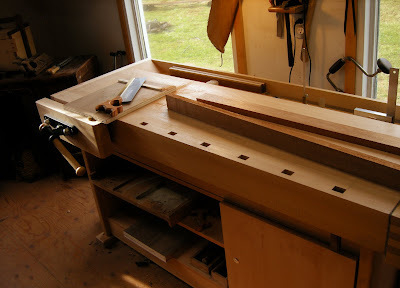 I’ll lay things out on the bench with clamps and knife in the joinery lines. 5 a.m. and I’m up to get the early worm. 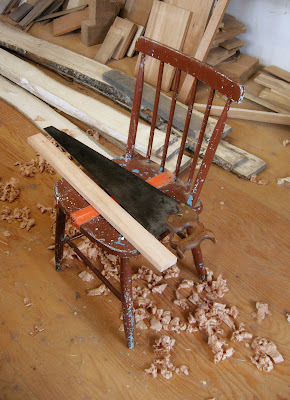 Some coffee and a fire will clear away yesterdays shavings and I’ll begin the joinery. 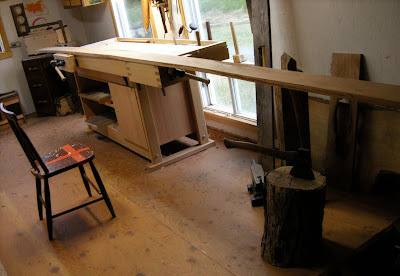 In the next shot you can see I’ve laid out the mortises but I totally gapped on any shots of the bridle joint sawing. The pieces are clamped securely down to the bench to with my surface clamp and a scrap oard so I don’t bruise the freshly planed surfaces. 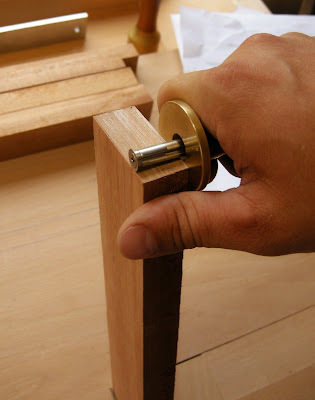 I’ll carefully chop out the waste with my mortise chisel and go ahead sawing the tenons. 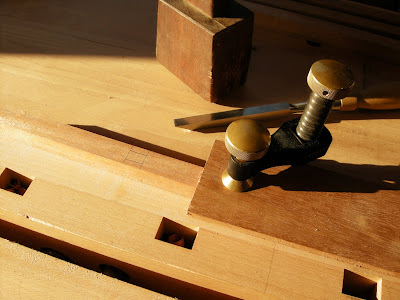 This process continues on from mortise to tenon, bridle to bridle. I find some days that these early morning wake up calls can get the brain on auto-pilot and before I know it I’m dry fitting the front lower assembly. I say front assembly because I’ve decided to make two upright frame sections for the stand; a thinner front assembly with an identical rear frame slightly larger than the first. This will add to the modern effect I’m looking for, almost cosmopolitan or a reflection of the city scape I’ve left behind a few weeks ago. 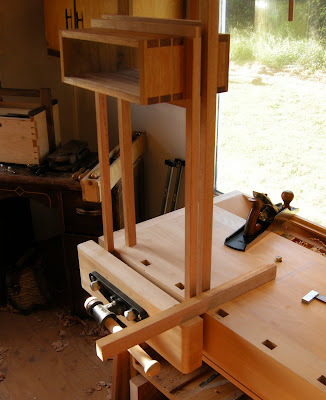 The shot above shows the front assembly clamped into my shoulder vise with the rear assembly piece balanced to see if I like where I’m going. Again the design evolves as I work and I allow the wood to dictate the forms as they develop into this small frame assembly almost alien in nature holding up the small structure. 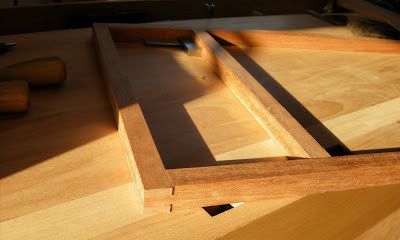 The rear frame components follow the same pattern as the first only with slightly larger pieces and joinery. 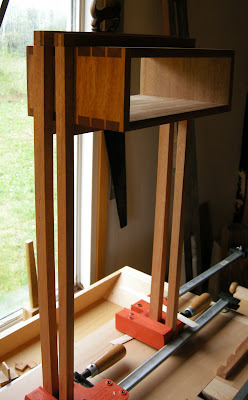 I’m moving along and am excited to get the feet started so I can stop rigging things up with clamps on the bench top. In the last shot you can see some of my Cabinet Master clamps acting as feet to hold the work tall and proud, this will again assist me in delivering a verdict on this design. I’m happy with the way this piece is progressing and I’ll rough out some stock for the feet. I decided to add another lower cross stretcher giving some more stability when the carcass gets pushed a little further ‘through’ the frame opening and cantilevers out a little bit more. The front left leg has a wild twist in it; I didn’t notice it until the four legs are together around the carcass. I think about removing it but later choose to let it stay where it is. It gives the piece a strange kind of movement, almost a sense of waiting, perhaps on a journey somewhere? 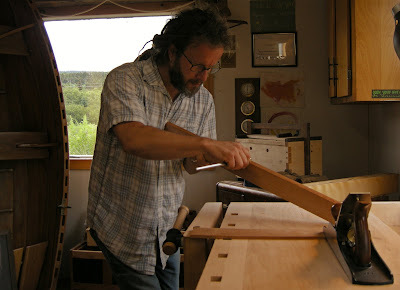 I’ve got the feet to chop for the leg tenons and then I can do some more shaping. This will have to wait a few days; we have some summer company coming to visit and there’s a list as long as my arm of things needing to be done around the house. 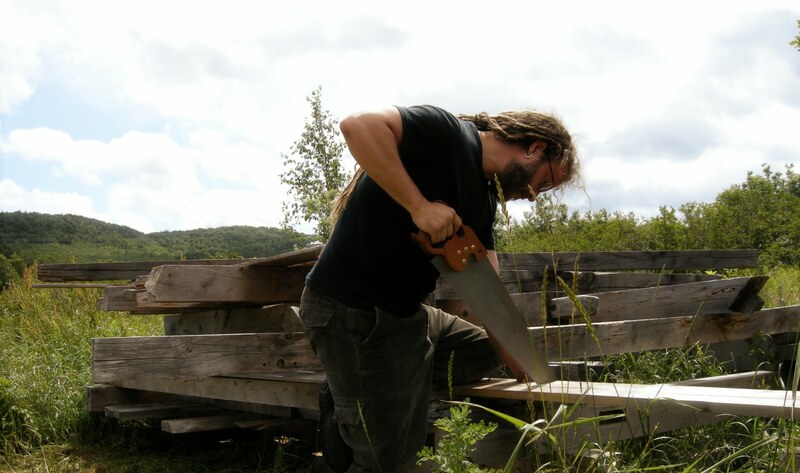 I’m off to the timber frame pile next to the shop to cross cut some planks for my daughters bed. We just set up a nice old sleigh bed for her and it seems to be missing the cross rail supports that’ll lie underneath the mattress. So with my panel saw and a framing square I have about 32 cross cuts to make in some old planks. It feels good for the soul to be outside under this summer sun working wood again. Nice to see you stop by. 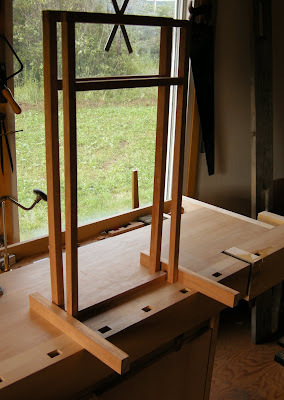 The door (just one) is on the workbench as I write. Just finishing up the panels and will fit the glass by weeks end. Then into the mouldings and finish. Two to three more weeks of Oak at the most! I have a few new projects rising up from the ashes and am still hoping to make it to WIA. It's closing in fast. ( it may take a small miracle to get down there in Oct. at this rate!) not enough hours in the day you know! Hey Tom good to see you are back in town, lets cut to the chase. When are we going to see the doors? No not the group, the Oak doors. Like the cabinet by the way. 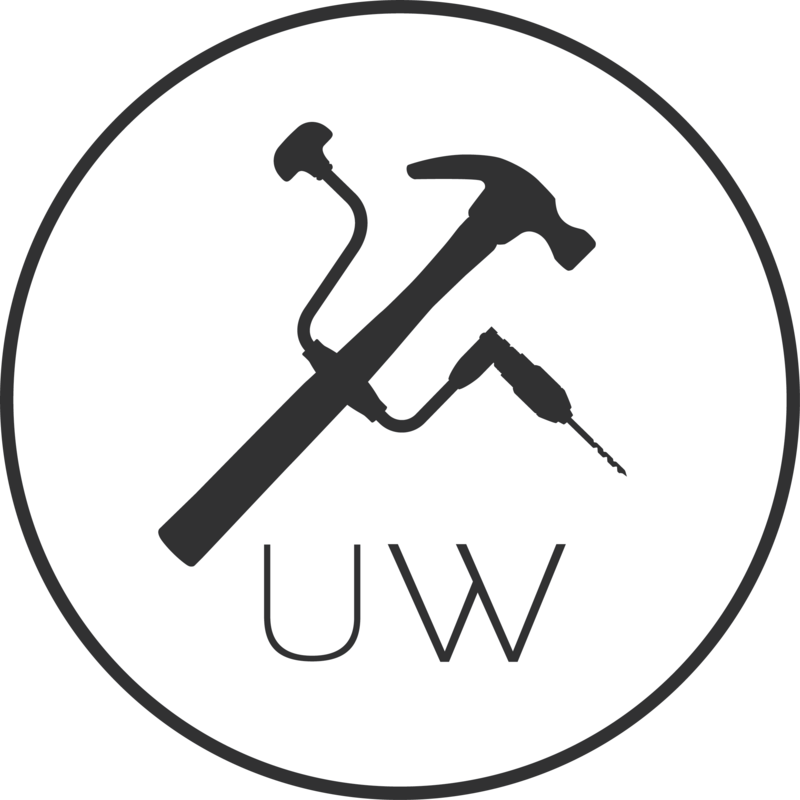 Are you going to WIA? Would love to see some shots of the project when you have some time to send. As usual, it on to a great project! I can't wait to see the rest of the evolution. I'm working right now on a small corner cabinet with coopered doors and I don't have much of a plan other than the idea in my head! Nice to follow your work!